Mapo doufu, or mapo tofu, is a popular Chinese dish from the Sichuan (Szechuan) province. It is a combination of tofu (bean curd) set in a spicy chili- and bean-based sauce, typically a thin, oily, and bright red suspension, and often topped with minced meat, usually pork or beef. Variations exist with other ingredients such as water chestnuts, onions, other vegetables, or wood ear fungus, but these are rarely considered authentic Sichuanese. True Mapo doufu is powerfully spicy with both conventional "heat" spiciness and the characteristic "mala" (numbing spiciness) flavor of Sichuan cuisine. The most important and necessary ingredients in the dish that give it the distinctive flavour are chili broad bean paste from Sichuan's Pixian county, fermented black beans, chili oil, chili flakes of the heaven-facing pepper, Sichuan peppercorns, garlic, scallions, rice wine. Supplementary ingredients include water or stock, sugar (depending on the saltiness of the bean paste brand used), and starch (if it is desired to thicken the sauce). 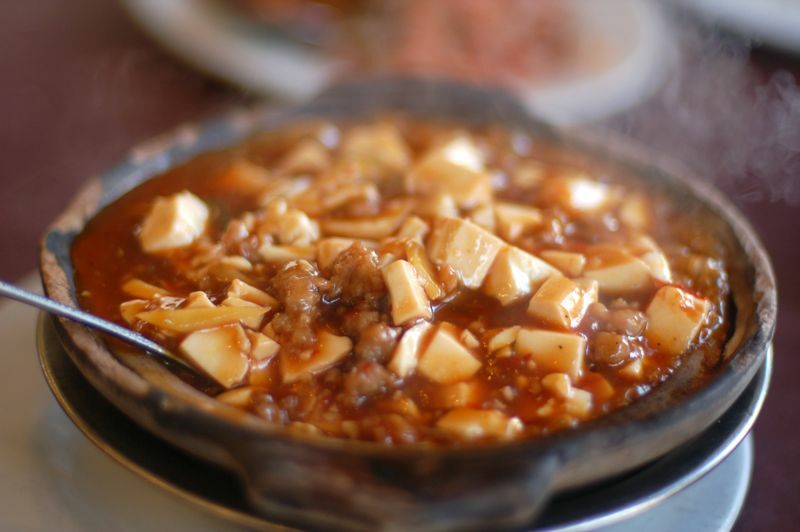 Mapo Doufu can also be found in the restaurants in other Chinese provinces and in Korea and Japan, where the taste is adapted to local tastes. In the west, the dish is often adulterated, with its spiciness severely toned down to widen its appeal. This happens even in Chinese restaurants, commonly those not specialising in Sichuan cuisine. In American Chinese cuisine the dish is often made without meat to appeal to vegetarians, with very little spice, a thick sweet-and-sour sauce, and added vegetables, a stark contrast from the authentic. Vegetarians can often still enjoy the powerful taste of the authentic dish, however, as it can easily be made without meat at all (and simply just tofu) while not toning down the spices; this version is technically referred to as Mala doufu although this name is not always well-known.